This is my entry to ARF/5-A-Day Tuesday #4, on its, well yes, fourth week, hosted by Sweetnicks, who also does the round-up of all entries every Tuesday evening. It is interesting to read about all the entries and try them on your own, as each includes at least one anti-oxidant rich food, or fruits and vegetables. In short, healthy. The main anti-oxidant ingredient in a baked buchi is the red kidney bean, which is way up there in anti-oxidant content - third in ranking, after wild red beans and wild blueberries. In the Philippines, it is readily available year-round and the most accessible among the top 20 ARF's. 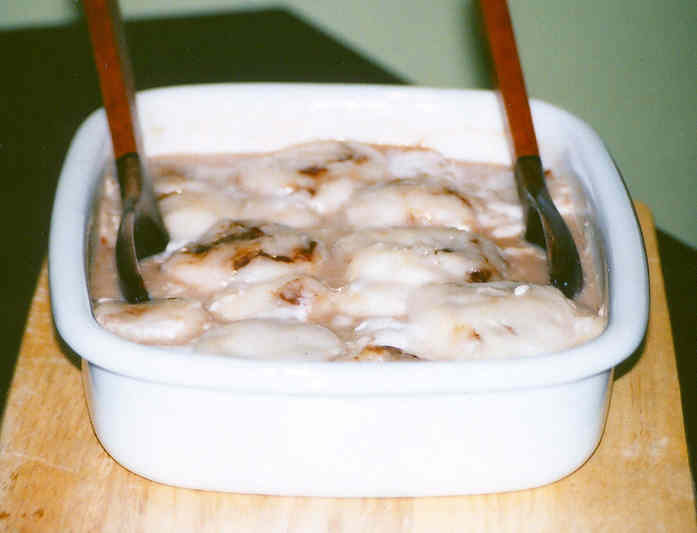 It is also widely eaten locally, as part of Mexican-influenced dishes, but mainly as a component of local desserts, like hopia (flaky, flat rounds of packed bread with sweet fillings of mashed beans, similar to the Japanese thin, round, filled cakes) and halohalo, literally and loosely translated as "many sweet things mixed together" and akin to many South-East Asian cold desserts. And of course the Chinese buchi, sweet-filled sesame-covered balls deep-fried to a puff. 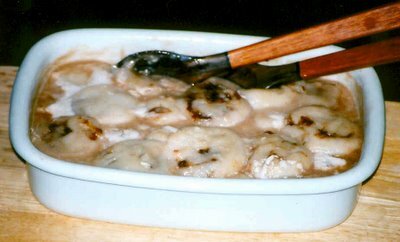 I don't know who influenced whom, in the case of buchi, because there is an emerging literature disputing the accepted origins of most Filipino foods, but here, if Chinese influence is proven, it doesn't really matter, because it has evolved and adapted to the Filipino palate and resources, becoming a naturalized Filipino in the process. It has become healthier, too, by not having to be fried in liters of cooking oil. Baked buchi is a common, streetside snack, but only in the central plains of Luzon - in the provinces of Bataan, Zambales and Pampanga. Elsewhere in the country, buchi is the Chinese buchi. I've never even come across baked buchi, if not for a couple of friends who have roots in Bataan and who have described the delicacy to me with such fondness and longing. One of them who recently went on a trip to Pampanga brought me some, and readily shared how it was cooked in his grandmother's house. Soak the red kidney beans in water for about five hours, then discard the water. Put the beans in a deep pan full of water and boil for about an hour. Discard the water again. Put back in a pan of water, adding about half of the sugar. Boil for another hour or longer, until mushy. Mash the beans finely and set aside. Discard the rice water, then ground (grinders, as well as ground rice, are available in most wet markets). Knead the rice dough into a long, thin roll, then cut into three-inch pieces. Flatten each piece into rectangles, spoon in some filling, then roll. Seal the edges by crimping the dough closed on both ends of the roll. Arrange in a ceramic baking pan. Soak the grated coconut meat in about five cups of hot water for a few minutes, then squeeze out the cream. Sieve the meat and set the squeezed-out cream aside. This is the kakang-gata. Repeat no. 5, this time using a fresh batch of hot water, about eight cups. Dissolve the remaining sugar, or adjust according to taste, in this cream. Pour the coconut cream squeezed last onto the buchi. Cover the pan with aluminum foil and bake on high for about 15-20 minutes. During the last five minutes of baking, uncover the pan, and pour in the kakang-gata. The buchi rolls are what are commonly sold in the provinces where they originated. I made mine ball-shaped like a Chinese buchi, flattening them out like how you flatten out a palitaw. This proved disastrous, though, because the balls were too thin to hold the filling together (or maybe I put in too much filling). The red kidney bean filling leached onto the coconut cream, turning it brownish, but the dessert turned out delicious, nonetheless, even though my friend and I forgot to mix sugar in the gata. So a note here: this is also good sugar-free, haha. And it can be eaten hot straight from the oven or cold straight from the ref the following day. I learned from a comment left on my post about Pinoy streetfood by Bataan native Apicio that these are called bilobilo and that many kinds of fillings are used, like ube (a kind of taro or purple yam), yellow munggo (mung beans) and red azukis, again, like the Chinese buchis. Serving all these together make for a colorful dessert. And traditionally, it is cooked in a clay oven, with burning coals placed on top and beneath, like how a bibingka galapong or latik is cooked. Isn't this what is called mochi in Pampanga? One word of caution, though - red kidney beans supposedly contain high concentrations of the toxic substance lectin, which can cause rapid and spontaneous food poisoning. This stems from eating the beans raw. This can be easily avoided by thoroughly cooking the beans and avoiding undercooking them. The beans are thoroughly cooked when they have turned plump and almost bursting in their skins. I've incorporated in the recipe the precautions that should be observed. Nice to know these background infos about buchi. I like to indulge in this kakanin from time to time. The version from our hometown may have been adopted from the Chinese. It is flat, round but filled with ordinary (green) mungo beans that is pre-cooked in sugar and coconut milk; and then deep fried in vegetable oil. I like this better than the buchi sold at chinese bakeshops and restaurants, probably because I grew up with it. kai, i'm going to try this today. pero siguro i won't make it into balls. interesting about apicio's comment. bilu-bilo where my family is from only refers to the mini rice balls that go into ginataan. Yo, that buchi is what we commonly have in Pangasinan. I just have a probably with the dripping oil. Ging, Yo's version is easier, so is Stef's. Stef, I'm making yours, in turn! Thanks for the link. wow, this has always been one of my favorite desserts. i never knew that it is this easy to do. thanks for the recipe!